I know it’s not quite to the last frost, but I looked at my schedule for the next few weekends and I just won’t have time to plant the veggies. I took half a day of vacation friday and got my seedlings into the ground. Saturday I worked on the gazebo again. I’ll have to post some pictures soon to show exactly what took what could have been 9 full days of gardening work since late November. Sunday I installed a drip system. 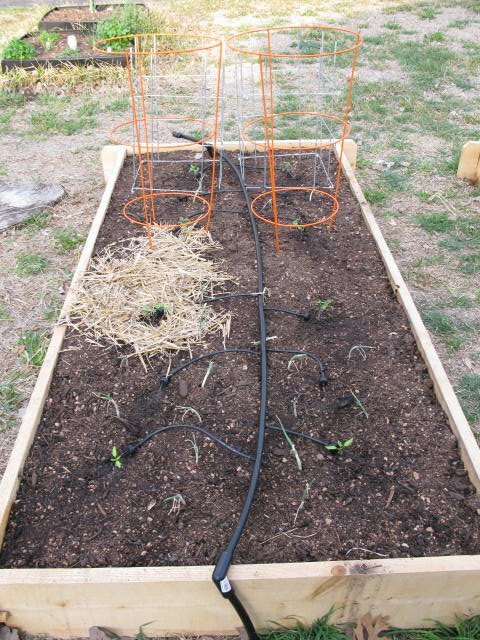 The new beds are really more than I have time to manage with the hose, and my tomatoes didn’t do as well as they could have last year with consistent watering. It wasn’t expensive, and not too difficult. I haven’t hooked up a timer yet. Right now I just turn on the hose while I’m getting ready for work or taking a morning walk. Tomato close-up. I plan on putting straw on all of the beds, once this cold front passes. 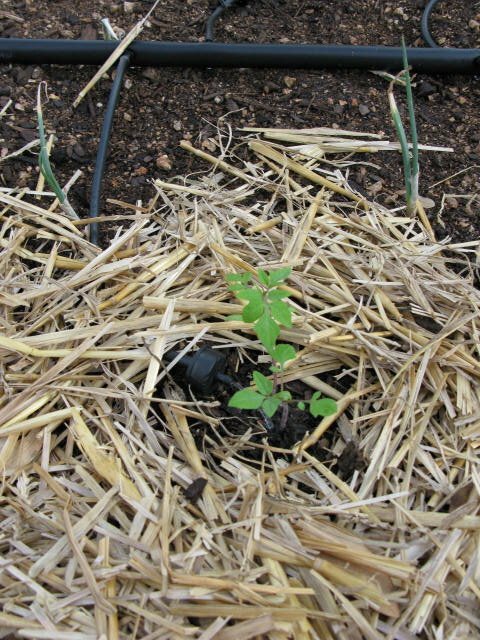 I did some research and found that straw is a cooling mulch. That is perfect for out hot summers, but no so great when you’re trying to keep the beds extra warm. Brandywine, romas and misc. peppers. I planned on remembering which peppers were which when I transplanted them into bigger pots and that didn’t work out so well. I planted all of them, so I guess it doesn’t matter too much. I’ll figure it out eventually. Okra and swiss chard. 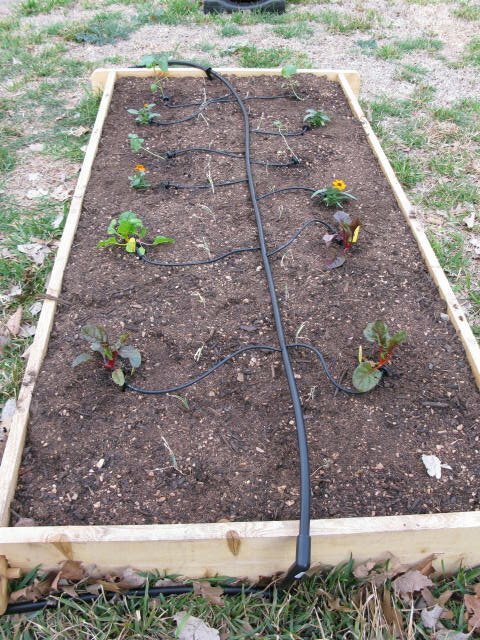 I’m also thinking of planting some sweet potatoes as well. Yellow squash and zucchini. The seed packed said these don’t always transplant well, but mine have really taken off in the last few days. 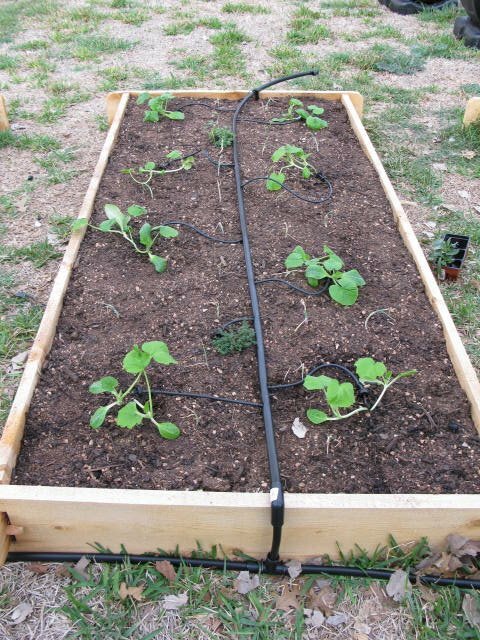 My trick will be trying to ward off the squash-vine borer. I didn’t have much luck last year. Rainbow Cherry, Sungold, misc. peppers. I have also scattered onions though all of the beds. After planting on friday the weather forecast kept getting worse. Monday afternoon I bought some row cover and covered everything last night. This should protect against potential frost, and the sub-45 degrees that we’ll be seeing the next few nights. 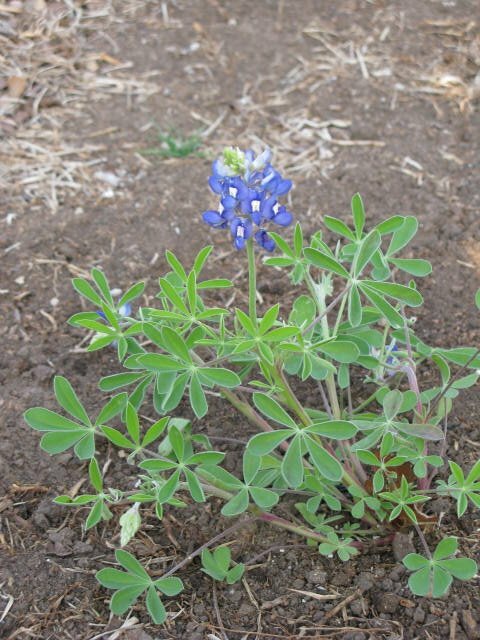 To fix my bloom issue … I picked up a few bluebonnets at the Natural Gardener. 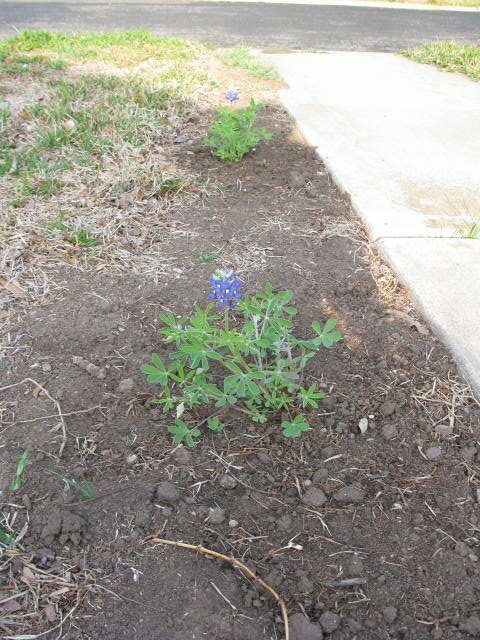 I planted them right by the front walk. Ahh … spring is here, except for that pesky cold front. Last night I planted some daylily bulbs in this bed as well. I’m hoping the rain will encourage them to pop up quickly. I’d eventually like to make this entire bed full of daylilies. One of my neighbors has a similar thing on the side of the house and it is really beautiful. I am planning on doing the yellow/orange varieties. 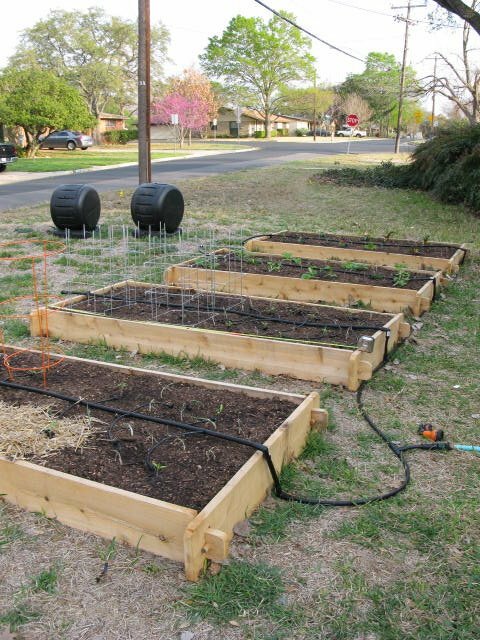 >Your veggie beds look great! We are opposite of you: our front yard is xeriscaped and our veggie beds are in the back.Good luck w/the squash. I decided to skip squash this time around, but I’ll be trying cucumbers for the first time.Cheers! >It’s great to see you’re back blogging. I was following yours for a while, but hadn’t seen any updates in at least 6 months, I’ll have to add you back to my list. Good luck with cucumbers, the squash-vine borers have a thing for them as well. I’ve wanted to try cucumbers, especially the pickling kind. You’ll have to let me know how they work out. >Good to know about the squash-vine borers liking cucumbers–darn! I’ll let you know how it goes.I never stopped blogging, but there’s something weird w/my feed that doesn’t automatically show updates. Sorry–I’m still trying to troubleshoot that problem. >Your beds look great. 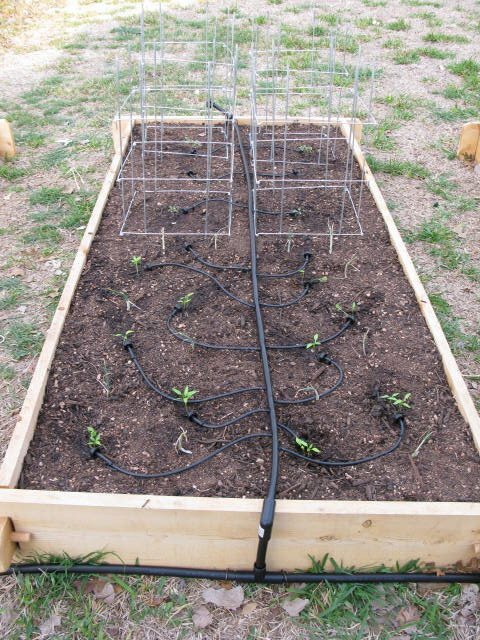 Where did you get your irrigation system? I’m going to try squash again this year. I heard you can cover them with row cover until you get flowers to try to keep the borers away. I’m going to give it a try.